The Olney Quadrilateral Division trains its members in first aid and home nursing. There is also a cadets division and for younger childen, Badgers. 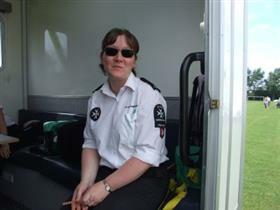 Members attend public events to provide first aid cover and also train the public. The Officer in Charge is Mrs. Crook. The group meets on Monday from 6.30pm to 9.30pm. Subscription of £20 are requested for cadets who range from 10-16. Over 16's join the adult members.